Salmon is widely known for its health benefits. It is a fatty fish that is loaded with Omega-3 fatty acids, which most people don’t get enough of. Unfortunately not all salmon is the same. Today, a lot of the salmon we eat isn’t caught in the wild, but bred in fish farms. Wild salmon is caught in the wild, in its natural environment… oceans, rivers and lakes. But half of the salmon sold worldwide comes from so-called fish farms, also known as aquacultures. The annual global production of farmed raised salmon has increased from 27,000 to more than 1 million metric tons in the past two decades. Whereas wild salmon eats other organisms found in its natural environment, farmed salmon are fed with high-fat processed foods in order to produce larger fish. Persistent organic pollutants sounds dangerous because they are. POPs have been linked to several diseases, including type 2 diabetes and obesity. Evidence suggests obesity might be even more of a risk factor for diabetes when POPs are present in your body. And specific types of POPs increase the risk of stroke in women. Why does this matter? Because PCB (one type of POP) levels are five to 10 times higher in farmed fish than in wild fish. Final Fact: Wild salmon wins here, hands down. Final fact: Both wild and farmed salmon come with risk if eaten in large quantities. But eaten in moderation, wild salmon is safer. Recent studies shows contaminents in farmed salmon were generally higher than in wild salmon. Contaminants were below the approved U.S. Food and Drug Administration tolerance levels, but they still surpassed the levels considered safe “for frequent consumption” by the Environmental Protection Agency. Other research has suggested that children, women of child-bearing age and pregnant women should choose wild salmon — or other sources of omega-3 fatty acids. Final fact: Both wild and farmed salmon contain contaminants, but wild salmon has lower levels and is safer overall for consumption. This was a source of debate in the late 1990s and early 2000s, when Chilean salmon imports to Japan had higher antibiotic amounts than allowed under regulations. The concern was too much exposure to antibiotics could lead to resistance to their effects. Antibiotic use in farmed fish is said to have been reduced, but it is unclear just how much use still occurs. Final fact: Farmed salmon comes with uncertainty about antibiotic use. Wild salmon does not. Both farmed and wild salmon have nutrients we all need. But it is becoming clearer that the risks associated with farmed fish are higher than concerns about wild fish. If you want to get the entire health benefits that fish such as salmon provide, your best bet is to keep it wild. 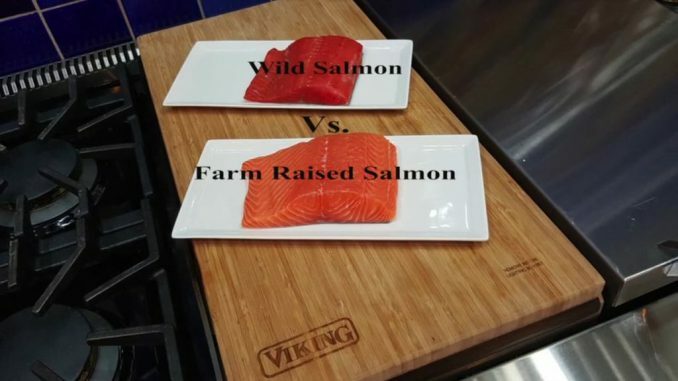 There are some key nutritional differences between wild and farmed salmon. A small fillet of wild salmon has 131 fewer calories and half the fat content of the same amount of farmed salmon. And although farmed salmon may have slightly more omega-3 fatty acids, it also has 20.5 percent more saturated fat content — and that’s fat you do not want. Final fact: Wild salmon gets the edge for having fewer calories and less saturated fat. Alexa Traffic Report: Accurate or Innaccurate? Incredible well written! I find it wonderful that you pointed out the differences between wild caught Salmon and farm raised Salmon. I myself am a huge organic food. It is really sad to see that so much farmed raised food is contaminated these days. It’s one of the reasons why me and my husband always try to buy food especially fish locally. Not only do you support your local business but the food tastes much better as well. Unfortunately I am more use to farm raised salmon, which probably goes for the majority of people who consume the fish. The taste is like a completely different fish, but there is a variety of wild salmon that I have yet to try. I try to consume wild salmon when possible, but most local stores do not have it for sell. It is definitely a healthier choice compared to what we a are use to. Your welcome. I agree and it is hard for me to adjust to such a difference in the way it tastes. I am wondering if maybe the different kinds of wild salmon taste different also as I would start to buy the one that taste more similar to the farm raised. The farmed raised is very yummy as you mentioned but deep down I always knew it would not be wise to consume more than once a week. Hi! Thanks so much for this very informative article on the differences between wild and farmed salmon. I totally agree with you that wild salmon takes the prize. I went on a cruise of Alaska a few years back and was taught all about the different types of salmon. I think there are seven. Anyway, while there, we ate a lot of salmon and there really is a taste difference. It tastes so much better than farmed salmon. While there, we had salmon jerky. Have you ever tried that? Yea I have had jerk salmon burger that is very delicious. It is sold at a restaurant near where I live, but I have not tasted the different variety of wild salmon. I hope to do so one day in my quest to get the one that tastes closest to the farm raised. I have actually enjoyed the farm raised more, but I know it is not the healthier choice. I am so use to that which is why I probably like it more. The taste from the wild pacific salmon is completely different but is quite tasty as well. Max, many years ago, when going to university in Vancouver, I did a summer job in Prince Rupert for one of the salmon companies. Being reasonably tall I worked with the men in the fresh salmon area. Generally the women in the cannery were First Nation and fairly short so the tables were set up for them. We got to take home salmon under a certain weight and my goodness the wild salmon tasted wonderful. There are five species of wild Pacific salmon off the north west coast of North America. It can seem like there are seven but two types have two names. For example if you see canned Red Salmon that is Sockeye. Sockeye is a fairly bony fish and is mostly canned so it is in better shape than Pink. I will never buy pink salmon as it is canned once it softens enough that it doesn’t hold its proper shape. Yes it does, to me, taste better but imagine how the impact on the wild salmon would be if no salmon was farmed! In Tasmania salmon farming is a big industry. At least one company is moving its nets out into the Great Southern Ocean. It will be interesting to see if this improves the quality. I like the information you have given in this post and will return to read more. I am glad you enjoyed the article and I am sorry for the late reply as I have been very busy. I never knew the difference between red and pink salmon until you explained it. I am going to get me a can and see if I can taste the difference. I am not to crazy about the Pacific Atlantic Wild Salmon that is sold in my local supermarket. I know there are different versions of wild salmon and I will make it a priority to do my taste test on each one. If Tasmania farming is using a different method when it comes to producing salmon that is healthier when it comes to the atmosphere it should become a trend other countries follow.